Hear about the importance and nature of storytelling in Aboriginal and Torres Strait Islander culture. Singer/songwriter Marcus Corowa draws on his Aboriginal and South Sea Islander roots to combine elements of blues, jazz and funk to create a soulful and soothing sound. Marcus may be a relative newcomer to the professional music scene, but he is already turning heads with his catchy melodies, heartfelt lyrics and silky smooth singing voice. He was awarded the 2012 Deadly Award for Most Promising New Talent in Music. 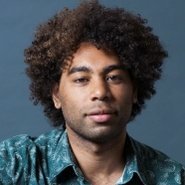 A gifted composer, Marcus penned the score for the musical The New Black which was showcased as part of the 2012 Arts Centre Melbourne Carnegie 18 program. In a special event, Marcus joins us to perform, tell his story and reflect on the importance of storytelling within music. Jack Charles is a veteran Indigenous actor, musician, respected elder and activist. He was co-founder of Nindethana, the nation’s first Indigenous theatre company, and has gone on to appear in numerous productions and films. Most recently he starred in Belvoir St Theatre’s production of Coranderrk which told the fascinating story of Coranderrk Aboriginal Reserve. Jack joins us to reflect on this mission history and to speak about his role as an actor in telling such stories. Speaking with Jack is Daniel Browning, an Aboriginal journalist and radio broadcaster from the Bundjalung and Kullilli people. Daniel produces and presents Awaye! , the Indigenous art and culture program on ABC Radio National. He has also guest-edited several specialist Indigenous issues of Artlink .